Walking through “Paris: Life & Luxury in the Eighteenth Century,” at the J. Paul Getty Museum in Los Angeles, I was always conscious of the iron fist beneath the velvet glove. Although this panoramic view of the decorative arts in eighteenth-century France has its share of sleek and seductive surfaces, by the time I left the galleries I felt as if I had been mugged by the eight-hundred-pound gorilla of design shows. The level of craftsmanship is so daunting that it frequently registers as a form of aggression. 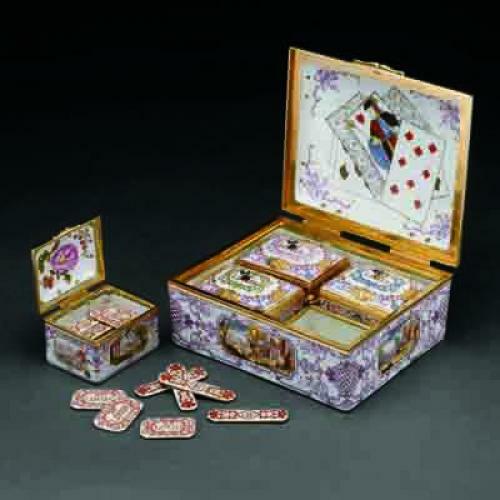 There is a little snuffbox in the exhibition, with an allegory of childhood by Nicolas Lancret rendered in enamel on a surface of varicolored gold, so overelaborated that it gives off bad vibes—a visual radioactivity. The exhibition—which travels to the Museum of Fine Arts in Houston after closing in Los Angeles on August 7—is a fascination. I admire the virtuosity with which cloth, wood, metal, and ceramics are manipulated in the dresses, furnishings, and objets d’art on display. And I am frankly bewitched by certain creations. There is a man’s at-home cap here—in white silk worked with yellow and gold threads and a scalloped brim—that is suffused with a goofy luxuriance, a fairy tale whimsy. And I cannot help but love the lunatic fantasy of a compound microscope with the central mechanism supported by gilt bronze volutes and S-curves—a rococo extravaganza—which leaves me wondering if the owner’s pursuit of scientific truth would not have been derailed even before his specimen came into focus. In such works I feel the continuation of a spirit of imaginative play that dates back to the arabesques and grotesques that medieval artists invented in the margins of illuminated manuscripts and that leads, in the nineteenth century, to the floral visions of Redon and the ravishments of art nouveau. Here virtuosity is linked with spontaneity and intuition—with an ability to make the unnatural feel natural, maybe with an ability to make the unnatural truly natural. But there is something else going on in this exhibition. Something I find troubling. The virtuosity of the great cabinetmakers, dressmakers, and metalworkers of eighteenth-century France can come uncomfortably close to kitsch. I find this a little shocking, because I would like to believe that craft is by its very nature clarifying, purifying. And here, well before the Marxists would say that industrialization had alienated man from his labor, we have the most extraordinarily refined workmen creating work that does not feel as if it has been deeply felt. While I realize that much of the blame may fall on impresarios of one sort or another, who decided what the craftsmen would produce, the gap between concept and execution, if indeed such a gap was widening at the time, is itself symptomatic. 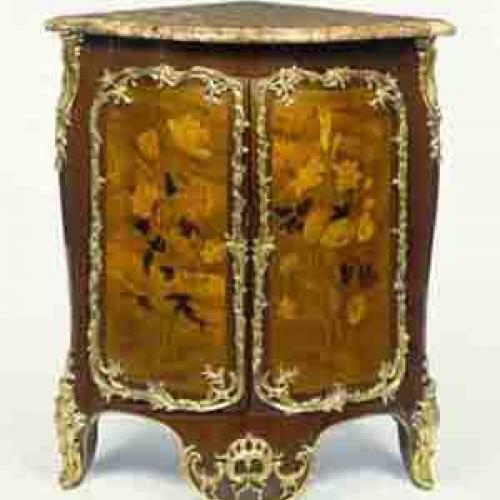 In any event, the workers who produced the elaborate marquetry and gilt-bronze mounts on a mid-eighteenth-century corner cupboard were dazzlingly proficient, among the greatest manipulators of materials who have ever lived, and yet the cabinet in question looks pompous and maybe even coarse, at least to me. I am tempted to say that the virtuosity feels like a hoax. And I don’t know quite what to make of my own reaction. The show is full of such conundrums. All too often, the rococo fantasies have lost their freshness, their athleticism. I am forced to conclude that sublime craftsmanship is not enough. This sugar rush of a show will surely leave some museumgoers yearning for simplicity. I found myself appreciating anew certain strains—of naturalism, of classicism, and of romanticism—that were gaining force in the later years of the eighteenth century and are reflected in the modesty of Chardin’s interiors, one of which, The Good Education, is included in the exhibition. In this luminous little picture the painter’s craftsmanship is understated, a riposte to the vainglory of the artisans. I am reminded of Chardin’s famous speech to the members of the Academy, transcribed by Diderot, in which this great painter described the artist’s training as a kind of trap. “Having used up days and passed nights by the lamp before an immobile and inanimate nature”—the casts after ancient statues from which students were first expected to draw—“we are presented with living nature; and at a blow the work of all the preceding years seems reduced to nothing; we were no more inhibited the first time we took up a pencil.” Chardin addressed these words to his fellow painters, and yet they may speak to the crisis of the Parisian craftsman as well, whose training in the refinements of decorative illusion could leave him incapable of producing work of true decorative power. Perhaps it was in eighteenth-century Paris, a time when the creation of beautiful objects was carried to heights of refinement previously unheard of, that refinement confronted one of its greatest crises—a decadence in decoration that would eventually precipitate a violent and brilliant reaction, in the primitivism of Gauguin and Picasso, in the expressionism of Manet and Van Gogh, and in the hard-fought, unvarnished elegance of Cézanne and Matisse. In Chardin’s still lifes, with their simple pots and pans and one or two discretely figured pieces of porcelain, we are already looking forward to the aesthetics of the Arts and Crafts Movement—if not to the revolutions of the Bauhaus. What I am left with is the thought that craft is no assurance of quality. I suppose I already knew this. And I suppose I should not be surprised that I sometimes try to forget it. 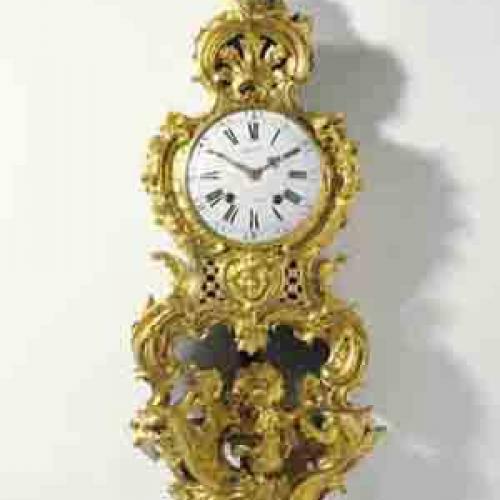 Surely the vexed relationship between craft and quality that has been so central to the art of the modern era begins way back in the eighteenth century, when craftsmanship was simultaneously triumphant and decadent, at the zenith of its powers and losing its way. Don’t get me wrong. There is much of enormous beauty at “Paris: Life & Luxury”: exquisitely embroidered dresses, suavely enchanting canvases by Boucher and Nattier, a mysteriously delicate illumination of Christ on the Cross by one Jean Pierre Rousselet, a gold and jasper Chinoiserie snuff box, a richly lacquered harpsichord. And yet there are many moments in this exhibition when I find myself wondering how so much refinement can feel so extraordinarily crude. Photos courtesy The Art Institute of Chicago (top) and The J. Paul Getty Museum (center and bottom).